먹다 - Megoda - Let's Eat! You must be a member of the Bangkok DinnerNations Group to attend this activity. Would you like to join this group? The ultimate comfort food! 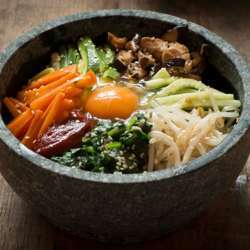 Bibimbap (비빔밥) is probably one of the most well-known and beloved Korean dishes to many people. Korean cuisine is largely based on rice, vegetables, and meats. Traditional Korean meals are named for the number of side dishes (반찬; banchan) that accompany steam-cooked short-grain rice. Kimchi is served at nearly every meal. Look forward to sharing this dinner with you all!